"Sacred Texts" redirects here. For the web site, see Internet Sacred Text Archive. Religious texts (also known as scripture, or scriptures, from the Latin scriptura, meaning "writing") are texts which religious traditions consider to be central to their practice or beliefs. Religious texts may be used to provide meaning and purpose, evoke a deeper connection with the divine, convey religious truths, promote religious experience, foster communal identity, and guide individual and communal religious practice. Religious texts often communicate the practices or values of a religious traditions and can be looked to as a set of guiding principles which dictate physical, mental, spiritual, or historical elements considered important to a specific religion. 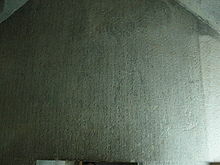 The terms 'sacred' text and 'religious' text are not necessarily interchangeable in that some religious texts are believed to be sacred because of their nature as divinely or supernaturally revealed or inspired, whereas some religious texts are simply narratives pertaining to the general themes, practices, or important figures of the specific religion, and not necessarily considered sacred by itself. A core function of a religious text making it sacred is its ceremonial and liturgical role, particularly in relation to sacred time, the liturgical year, the divine efficacy and subsequent holy service; in a more general sense, its performance. It is not possible to create an exhaustive list of religious texts, because there is no single definition of which texts are recognized as religious. 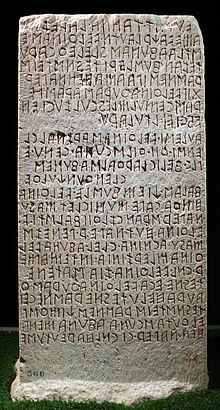 One of the oldest known religious texts is the Kesh Temple Hymn of Ancient Sumer, a set of inscribed clay tablets which scholars typically date around 2600 BCE. The Epic of Gilgamesh from Sumer, although only considered by some scholars as a religious text, has origins as early as 2150-2000 BCE, and stands as one of the earliest literary works that includes various mythological figures and themes of interaction with the divine. The Rig Veda of ancient Hinduism is estimated to have been composed between 1700–1100 BCE, which not only denotes it as one of the oldest known religious texts, but also one of the oldest written religious text which is still actively used in religious practice to this day, though no actual evidence of this text exists prior to the 13th century AD. There are many possible dates given to the first writings which can be connected to Talmudic and Biblical traditions, the earliest of which is found in scribal documentation of the 8th century BCE, followed by administrative documentation from temples of the 5th and 6th centuries BCE, with another common date being the 2nd century BCE. 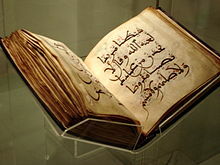 Although a significant text in the history of religious text because of its widespread use among religious denominations and its continued use throughout history, the texts of the Abrahamic traditions are a good example of the lack of certainty surrounding dates and definitions of religious texts. High rates of mass production and distribution of religious texts did not begin until the invention of the printing press in 1440, before which all religious texts were hand written copies, of which there were relatively limited quantities in circulation. A religious canon refers to the generally accepted, uniform, and often unchanging collection of texts which a religious denomination considers comprehensive in terms of their specific application of texts. For example, the content of a Protestant Bible may differ from the content of a Catholic Bible - insofar as the Protestant Old Testament does not include the Deuterocanonical books while the Roman Catholic canon does. Protestants and Catholics use the same 27 book NT canon, as well as the same 39 book OT protocanon, also shared by Jews. The word "canon" comes from the Sumerian word meaning "standard". Hierographology (Ancient Greek: ἱερός, hieros, "sacred" or "holy"; γραφή, graphe, "writing"; λόγος, logos, "word" or "reason") (archaically also 'hierology') is the study of sacred texts. The following is an in-exhaustive list of links to specific religious texts which may be used for further, more in-depth study. Digha Nikaya, the "long" discourses. Majjhima Nikaya, the "middle-length" discourses. 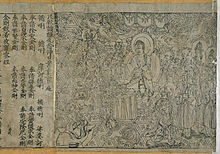 Samyutta Nikaya, the "connected" discourses. Anguttara Nikaya, the "numerical" discourses. Khuddaka Nikaya, the "minor collection". The Bible (the Old Testament and the New Testament). The Apostolic churches (Catholicism and Orthodoxy) also include the Deuterocanonicals. The Liturgical books. Almost each Denomination has its own Worship or Service Books within their Church. These books are also considered religious texts. 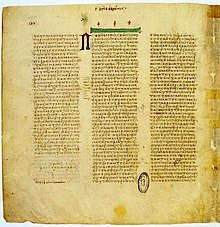 For Catholicism, this includes seven deuterocanonical books in the Old Testament for a total of 73 books, called the Canon of Trent (in versions of the Latin Vulgate, 3 Esdras, 4 Esdras, and the Prayer of Manasseh are included in an appendix, but considered non-canonical). For the Eastern Orthodox Church, this includes the anagignoskomena, which consist of the Catholic deuterocanon, plus 3 Maccabees, Psalm 151, the Prayer of Manasseh, and 3 Esdras. 4 Maccabees is considered to be canonical by the Georgian Orthodox Church. The Ethiopian Orthodox Tewahedo Church (and its offspring, the Eritrean Orthodox Church) adds various additional books depending on the specific enumeration of the canon (see Ethiopian Biblical canon), but always includes 4 Esdras, the Book of Jubilees, 1 Enoch, 4 Baruch, and 1, 2, and 3 Meqabyan (no relation to the Books of Maccabees). Some Syriac churches accept the Letter of Baruch as scripture. For Protestantism, this is the 66-book canon - the Jewish Tanakh of 24 books divided differently (into 39 books) and the universal 27-book New Testament. Some denominations also include the 15 books of the Apocrypha between the Old Testament and the New Testament, for a total of 81 books. The Bible (left) and Science and Health with Key to the Scriptures (right) serve as the pastor of the Christian Science church. Science and Health with Key to the Scriptures by Mary Baker Eddy. This textbook, along with the Bible, serves as the permanent "impersonal pastor" of the church. The Church of Jesus Christ of Latter-day Saints (LDS Church) uses the LDS edition of the King James Bible for English-speaking members; other versions are used in non-English speaking countries. The Community of Christ (RLDS) uses the Joseph Smith Translation, which it calls the Inspired Version, as well as updated modern translations. The Pearl of Great Price is authoritative in the LDS Church, rejected by Community of Christ. There are significant differences in content and section numbering between the Doctrine and Covenants used by the Community of Christ (RLDS) and the LDS Church. 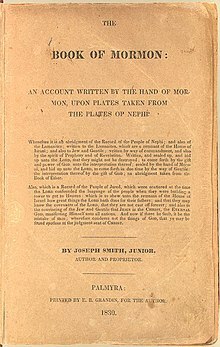 Other, smaller branches of Latter Day Saints include other scriptures, such as the Book of the Law of the Lord used by the Church of Jesus Christ of Latter Day Saints (Strangite) or The Word of the Lord used by Fettingite branches. The writings of Ellen White are held to an elevated status, though not equal with the Bible, as she is considered to have been an inspired prophetess. 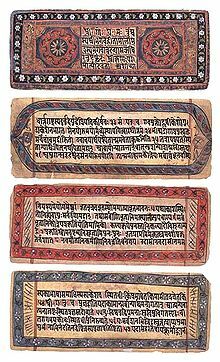 The Bhagavad Gita is Lord Krishna's counsel to Arjuna on the battlefield of the Kurukshetra. 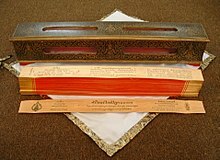 Each four Kirati people have their own Scripture. The Kephalaia (Greek: Κεφάλαια), "Discourses", found in Coptic translation. Non-LaVeyan Satanists may not use any specific holy book. 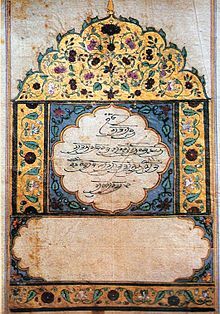 Illuminated Guru Granth folio with Mul Mantar(basic religion mantra) with signature of Guru Gobind Singh. The Yasna, the primary liturgical collection, includes the Gathas. The Visperad, a collection of supplements to the Yasna. The Yashts, hymns in honor of the divinities. The Vendidad, describes the various forms of evil spirits and ways to confound them. shorter texts and prayers, the Yashts the five Nyaishes ("worship, praise"), the Sirozeh and the Afringans (blessings). The Zend (lit. commentaries), various commentaries on and translations of the Avesta. The Khordeh Avesta, Zoroastrian prayer book for lay people from the Avesta. ^ Kramer, Samuel (1942). "The Oldest Literary Catalogue: A Sumerian List of Literary Compositions Compiled about 2000 B.C.". Bulletin of the American Schools of Oriental Research. 88: 10–19. ^ Sanders, Seth (2002). "Old Light on Moses' Shining Face". Vetus Testamentum. 52: 400–406 – via EbscoHost. ^ Enheduanna; Meador, Betty De Shong (2009-08-01). Princess, priestess, poet: the Sumerian temple hymns of Enheduanna. University of Texas Press. ISBN 9780292719323. ^ George, Andrew (2002-12-31). The Epic of Gilgamesh: The Babylonian Epic Poem and Other Texts in Akkadian and Sumerian. Penguin. ISBN 9780140449198. ^ "The Yahwist". Contradictions in the Bible. 2012-12-23. Retrieved 2016-12-06. ^ a b Jaffee, Martin S. (2001-04-19). Torah in the Mouth: Writing and Oral Tradition in Palestinian Judaism 200 BCE-400 CE. Oxford University Press. ISBN 9780198032236. ^ a b Ulrich, Eugene (2002). "The Notion and Definition of Canon". The Canon Debate. pp. 21–35. ^ "scripture - definition of scripture in English | Oxford Dictionaries". Oxford Dictionaries | English. Retrieved 2016-12-06. ^ "Caodaism In A Nutshell". ^ Eastern Orthodox also generally divide Baruch and Letter of Jeremiah into two books instead of one. The enumeration of the Books of Ezra is different in many Orthodox Bibles, as it is in all others: see Wikipedia's article on the naming conventions of the Books of Esdras. The Buddhist Scriptures Compared with the Bible by Robert H. Krueger.